Wednesday morning I got up early while the woods were wet with dew and the wind was still. 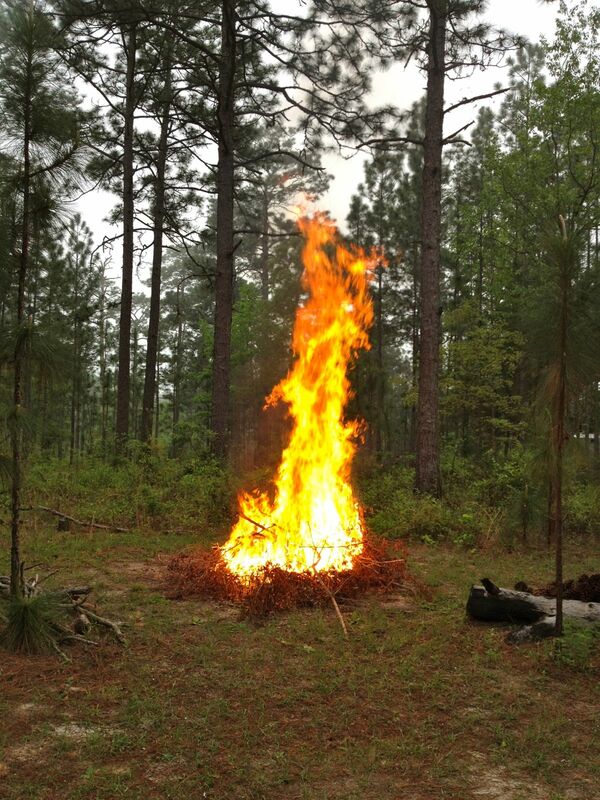 I made a cup of tea then went out in the yard and set my brush pile on fire. 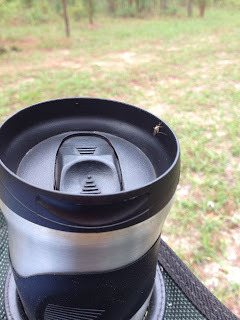 I sat in my folding chair with my tea and photographed mosquitoes while I watched the fire burn down. When it burned down enough to get close to it I used my pitchfork to throw the ends back in the middle. It was done in half an hour. Thursday afternoon I noticed the pile of ashes looked funny. This morning I was on the lookout. That turkey was heading straight for my fire place. He gives it a little scratch to test the quality. And he gets right in there and shakes around. Here's the shape he made in the dust by the fire. This must be like the shampoo. Then he gets up and moves over a bit. Here's the mess he made right in the middle of the cold ashes. Surrounding himself in a cloud. More of the view from my East window. This is who lives in the burrow by the stump. The aptly named Stump Gopher. Who I believe is Driveway Gopher with new digs. This is the warning sign I painted for delivery men who drive too fast. I hope Johnny Hart doesn't mind that I used his art. Here's the hole of the juvenile gopher right on the other side of the driveway. I like having tortoises I can see from my windows. If I go outside to take their picture they scoot back down their hole. It makes a funny noise. I wish I could record it. In case anybody is confused: my gophers and Nathan Fillion's gophers (http://www.whosay.com/nathanfillion/photos/151651) are totally different. Mine are reptiles. His are mammals. Mine are Gopherus polyphemus, named for the mammal because they both dig holes. But while brown furrry gophers are varmints, reptile gophers are a protected species and you aren't even allowed to touch one without a special permit. I like them because they keep the grass around their burrows very nice. A little bahia grass lawn in the wild woods. A lot of ignorant people don't like them in their yard because they claim they "attract rattlesnakes." That's ridiculous. I just want to say that I got great enjoyment and satisfaction from reading this post, and the addendum.